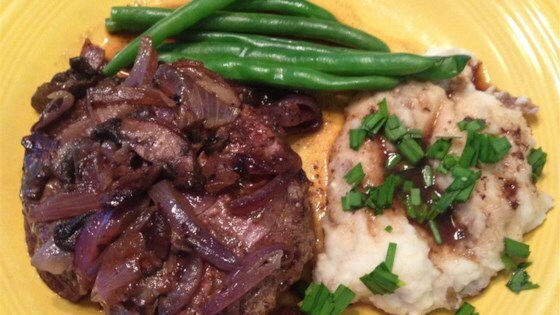 "Beef eye of round steaks are simmered in a red wine sauce until tender enough to cut with a fork. This is said to be one of former President Ford's favorite recipes." Heat the oil in a large skillet over medium-high heat. Add onions; cook and stir until lightly browned and tender, about 5 minutes. Remove the onions from the skillet using a slotted spoon and set aside in a bowl. Season the steaks with thyme and seasoned salt, then dust them lightly with flour. Fry the steaks in the skillet over medium-high heat until browned on each side, about 5 minutes per side. Pour the red wine and beef consomme in with the beef. Return the cooked onions to the pan. Cook over medium-high heat until the aroma of wine dissipates, 2 to 3 minutes. Reduce heat to low, cover, and simmer for 1 hour. Serve steaks with the sauce and a garnish of fresh parsley. DELICIOUS! Long slow simmering is key. Half way thru the simmering I added some quartered new potatoes and a splash more wine. What a wonderful gravy it made. I'll definately make this again!